YOUR BUSINESS WORKFLOW NEEDS A TCOE. WE DELIVER IT. Organizations these days are going through demanding situations in keeping application/product excellent, underperforming checking out features, suboptimal utilization of humans, gear, infrastructure, and inconsistent take a look at processes throughout places. 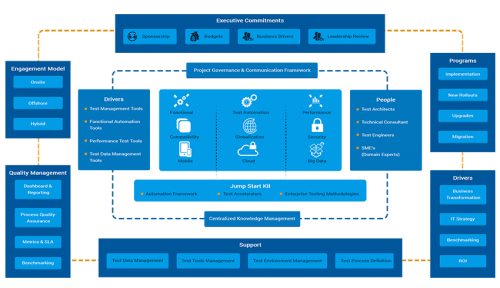 Setting up a TCoE creates a centralized testing characteristic, allows gain progressed efficiency, optimizes human beings/tool utilization, and decreases testing costs. 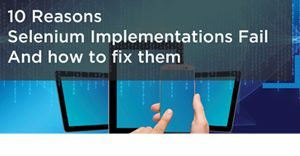 Implementing the guidelines using a TCoE expert enables organizations to build a green, dynamic, and lean testing characteristic. TGGTECH’s TCoE Services have consistently met and exceeded the needs of enterprises, ISVs across the verticals. Proven expertise in TCoE setup for large organizations. Process Asset Library with over 500 components for standardization process which are customizable. TGGTECH’s TCoE Framework (SCALE) is designed to offer a holistic and included way to reap excellence for a trying out agency or unit. The proprietary framework includes middle elements addressing all aspects of an enterprise. Executive Commitments: The Executive Management takes responsibility for the fulfillment of TCoE via carrying out everyday leadership review meetings. It ensures that budgets are allotted, dreams and targets are described for the checking out agency. Quality Management: TCoE implements and follows standard process quality assurance practices. Jumpstart Kit:The jumpstart package speeds up preliminary setup time of TCoE by way of providing custom designed frameworks for enhancing productivity and lowering system cycle time. 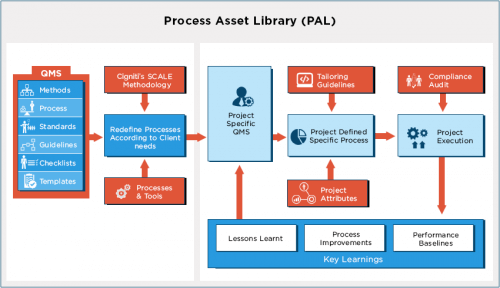 The accelerator kit consists of a Process Asset Library (PAL) that includes over 500 extraordinarily validated customizable belongings including suggestions, templates, checklists & requirements that can be effortlessly deployed for standardization. 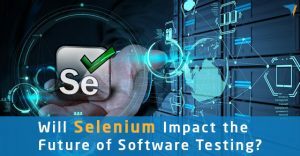 Core Testing Services: The core testing services component of TCoE framework is responsible for providing all types of testing across the entire organization. At TGGTECH, we've set up Software Testing Centers of Excellence round Mobile, Performance, and Security Testing. We have installation devoted labs within the enterprise which our customers leverage for gaining maximum advantage from their QA funding. 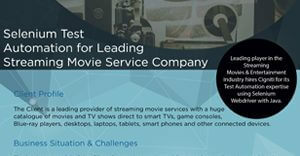 Leading player in the Streaming Movies & Entertainment Industry hires TGGTECH for its Test Automation expertise using Selenium Webdriver with Java. TGGTECH has accomplished practical and regression checking out for a number of clients throughout domain names. Below is the partial listing of clients who accept as true with TGGTECH for their useful software testing desires.